Skull and Bones: Native American burial remains at UC Berkeley. The Native community and many social justice groups gathered at noon today on the University of California Berkeley campus to mark the commencement of the 2008Longest Walk 2. Among the many speakers was co-founder of the American Indian Movement (AIM), Dennis Banks. 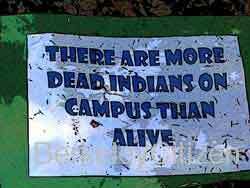 Banks voiced outrage over the tens of thousands of native remains being held in boxes at the school and at other institutions. He called for the return of all burial remains to their communities. The Native American leader also demanded that the governmentcease its longest undeclared war, the war against all its Native Peoples.